← ‘Saturn Returns’, a narrative feature film, is shooting in June 2014! Into the Land of Snows operates at two levels. On one, it is the pacy ‘coming of age’ tale of Blake, a young American in his mid-teens, unhappy and confused following his parents’ recent divorce for which at the start of the book he blames his father, Dr McCormack. The latter is a medic on an expedition to climb Mount Everest, the world’s highest mountain, known by the Sherpa people of the region as Chomolungma, Goddess of the World. Blake’s mother, worried on finding a marihuana joint in his pocket, sends him off to join his father at Everest’s base camp in a bid to get him away from bad influences at home and also to enable some quality time between father and son. Following a serious mountain accident, however, Dr McCornack sends Blake away for safety reasons in the care of Ang Thondup, a trusted, experienced Sherpa mountain guide. The book charts Blake’s process of maturation as a result of intense exposure to Tibetan Buddhist culture whose beliefs and values – centring round what reality may be – are bewilderingly and challengingly different from those of the highly materialist West in which Blake has been growing up. The hardships and adventures he and Ang encounter on their journey, an important part of which is Blake’s solo venture to effect Ang’s successful rescue, are also vividly portrayed. Central to the whole plot is an old camera gifted to Blake by Dawa, a young Sherpa, on which Blake is excited to find not only what seems to be a photograph featuring George Mallory, the famous missing explorer from the 1920s whose frozen corpse was found not long ago on Everest, but also what could be the world’s first authentic photo of a Yeti, the fabled Abominable Snowman of many tales and legends. Blake’s initial excitement and desire to share this discovery on his return home to the USA is challenged in a most interesting way by a wise lama he encounters to whom Ang, a former monk, decides to give the camera – much to Blake’s initial anger and feelings of betrayal. The outcome of this ‘coming of age’ tale which I will leave for the reader to discover, is satisfyingly positive. At another level, however, I detect a deeper purpose on the part of Ellis Nelson than that of writing an interesting, absorbing and unusual adventure story initially aimed at a young readership. The clue is in the quotation which heads up the whole book and this post. Through immersing the reader in a very different way of life to that of our Western culture increasingly dominated by a materialist, reductionist ethos, Ellis Nelson takes us on a journey through various well-documented aspects of Buddhist, and in particular Tibetan Buddhist, culture and religion. We hear about the Four Noble Truths and the Eightfold Path, basic tenets of Buddhist belief and practice. We find out about the Bardo states which occur after death, how they are negotiated, and why it is thus the case that bodies must be left undisturbed for three days after people die. We encounter runners so light that their bodies have to be weighted down with chains; monks who dip themselves in freezing rivers, warming their bodies and drying their clothes through mind power; sky burial in which corpses are chopped up and fed to the high plains vultures. We encounter telepathic communication from the wise lama, temporary custodian of Blake’s camera, in order to reassure both Blake and Ang whilst Blake is effecting the latter’s rescue. The piece de resistance, however, occurs in a remote mountain cave inhabited by a solitary monk.Whilst finding a rope with which to rescue Ang who is trapped on a ledge fifty feet below the damaged path they are travelling, Blake witnesses something startling, scary and utterly challenging to our conventional notions of the boundary between illusion and reality. The chanting and meditating monk, his back to Blake, conjures out of a coil of smoke the very Yeti pictured on Blake’s photograph – complete with its stink, its piercing scream of fear and its rushing out of the cave when Blake touches it. He discovers that it is indeed ‘real’…. I enjoyed reading Into the Land of Snows very much. Having already over a number of years read extensively about Buddhist religion and practices, as well as being an intermittent meditator myself, none of the material Ellis presents here is new to me although I find reflecting on it compelling all over again. I think that any open-minded reader encountering this book would be drawn to read more searchingly and more deeply from this able introduction. 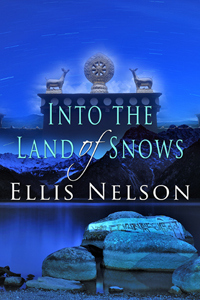 Ellis Nelson in Into the Land of Snows hasn’t just been telling a vivid story. She has been challenging us to take a long, hard look at what we think ‘reality’ actually is…. Ellis Nelson has served as an Air Force officer, government contractor, and teacher. She has had an interest in Buddhism since childhood. Currently, she lives in Colorado Springs, CO with her husband. Email contact: himalayaspencerellis(at)yahoo.com. You may also friend Ellis Nelson on FACEBOOK or follow on TWITTER. Her first book was published in Feb. 2012. This entry was posted in 02 - New Posts: January 2014 onwards, Book Reviews 2014 and tagged 'Into the Land of Snows', Ayradeva quotation, Bardo states, Chomolungma, Eightfold Path, Ellis Nelson, Four Noble Truths, George Mallory, Tibetan Buddhist culture. Bookmark the permalink.